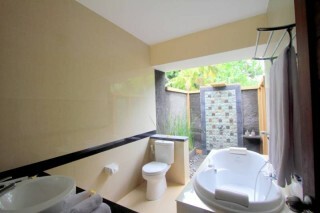 This villa is conveniently located in the heart of Nyuh Kuning village in Ubud away from all the busy package tourists in downtown Ubud. 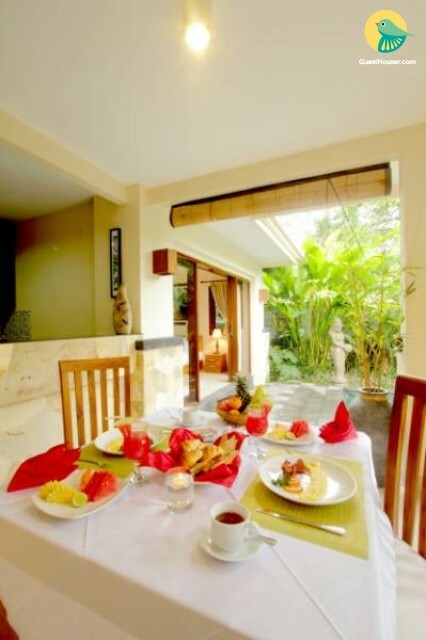 Located just 5 minutes outside of town, this villa offers you and your family & friends a quiet place to relax and enjoy all that Bali has to offer. This property is at a peaceful haven very close to central Ubud, an intersection of spirituality, Balinese tradition, shopping, and fun. You can visit the Sacred Monkey Forest, eat great for crazy cheap, take a short drive to the beach, or visit Ubud’s famous museums. The windows from the rooms look out to the pool and beautiful rice fields and the sacred Mt. Agung. 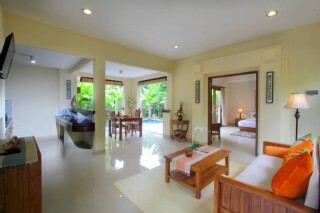 The villa will provide you with a TV, air conditioning and a terrace. There is a full a kitchenette with a refrigerator and a dining table. Your rooms are on the ground floor with their own bathroom, soaking tub and air conditioning, also comes with a bath and free toiletries. Outside your room is an open air, comfortable sitting area with a couch, and kitchen area with table and six chairs. You can find refreshment with a dip in the pool, day or night. It’s 1.7 meters deep with a sitting ledge. There are also 2 pool chairs to relax in.